Shoumi Sen is an author, an engineer, and a co-host of #diversekidlit! 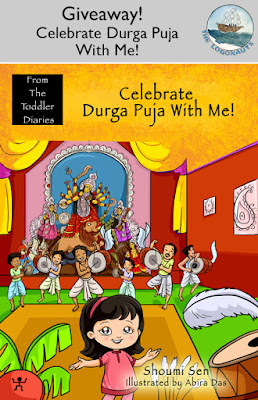 I am excited to talk with her today about the new book in her series, From the Toddler Diaries: Celebrate Durga Puja With Me! She is even offering a free copy of the book to one lucky reader! Shoumi Sen is a Strategy, Sales and Marketing professional at a leading Energy Management company. She grew up in Bombay and Dubai and studied Engineering at BITS, Pilani and the University of Maryland, College Park. She loves to travel, has lived and worked in many countries, and currently lives in Los Angeles, California with her husband and daughter. Writing originated as one of my many ways to have my daughter appreciate a constant connection with her Indian roots, while living in California. Growing up in Bombay and Dubai, my sister and I found ourselves surrounded by the magic of Indian festivals. I remember the excitement during Durga Puja, Holi, Diwali and Christmas from my childhood. I searched for books which would help me paint these magical cultural experiences for my daughter and eventually decided to write one. I wanted to be so many different things - an astronaut, a cricket player, a doctor, a school teacher. I liked math, this led me to engineering through grad school and now I am an engineer turned marketing professional who loves to write! As a kid I grew up with many of Enid Blyton's books such as The Famous Five, The Secret Seven, Malory Towers, and my friends and I would often enact scenes from these books! I read a ton of Bengali books as well, and enjoyed the writings of Satyajit Ray. What was the inspiration for From The Toddler Diaries? 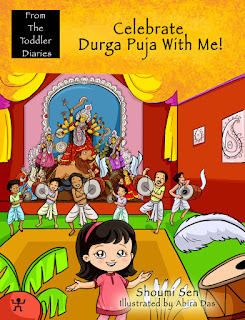 My daughter is the inspiration for "From The Toddler Diaries"; my first book, Celebrate Durga Puja With Me! started off as a poem about Durga Puja. This festival is celebrated widely in India and I wanted to share my childhood memories with my then 2-year-old so she would understand why she got to wear gorgeous Indian dresses on a certain weekend in October and eat delicious Indian sweets. There’s excitement at the mall! I have had several readers tell me that their kids can identify with verses such as these because they can easily relate to them. My protagonist is little Riya, and my books aim to paint my cultural experiences and childhood memories in words that a child can easily understand. It is important to me that my writing should capture the appreciation of a child’s clarity in perception, which is magical in its simplicity. When I hear from my readers - parents and kids alike – the part of me that always wanted to be a teacher is thrilled to know that my book is making a difference. If you want to write, you should! Do not worry too much about how you will get published – things will eventually fall into place. Your primary focus should be on your writing - an article, a story or a novel, whatever it is you want to write. Along with writing, make sure you always keep reading. Remember the famous Dr. Seuss quote? "The more that you read, the more things you will know. The more that you learn, the more places you'll go." Amazon link: Celebrate Durga Puja With Me! Review of Celebrate Durga Puja With Me! My review: Celebrate Durga Puja With Me! 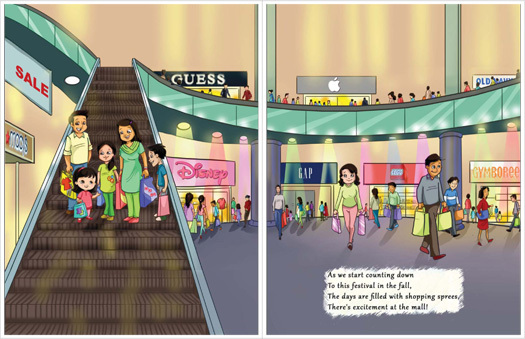 is a bright and vibrant picture book for young children about the Indian holiday of Durga Puja. Told in short, rhythmic stanzas, narrator Riya introduces readers to the background and events of this holiday. The context and illustrations help explain some of the words that might be unfamiliar, though a glossary at the end would help reinforce them too. This would be a great book to introduce a new holiday to children or to teach kids about their own heritage. Any child will certainly react with awe to the colorful street lights, the brightly-painted statues, and, of course, the dancing! This would also be a great addition to classrooms looking to celebrate diverse holidays from around the world. Please enter the giveaway below to win your own copy of Celebrate Durga Puja With Me! (US domestic addresses only). Lovley interview - thank you to both of you! Thanks Marjorie for your kind words - Katie and I had fun collaborating on this! What a wonderful way of helping kids connect with festivals and find out more about them. With Durga Puja close by this one would be such a great read. Enig Blyton seems to be such an essential part of most of our child hods. She's a huge favourite of mine too.